Mr. Crocodile, Do You Like Codfish? As alluded to in a previous post, I had a big (over 2 pounds) packet of fresh Pacific cod fillets to work with last week. I had been hoping for salmon, but we’re salmon snobs, and only the pink farmed stuff was available; needless to say, I adjusted my plans. Cod isn’t my favorite, but this was firm, versatile fish and we got two excellent meals from it, so I guess there will be more cod in my future. The first recipe, Baked Fish and Potatoes with Rosemary and Garlic, was from Marcella Says… , reprinted on Epicurious here. Since Marcella has never yet steered me wrong, I felt pretty confident about this one, and sure enough, it was delicious: simply roasted potatoes and crumb-topped fish all scented with fresh rosemary. I used fingerling potatoes and added in some carrots (for color, I will readily admit! 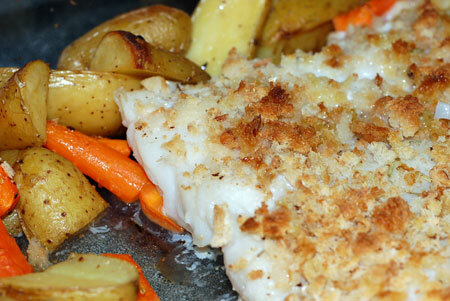 ), and topped the fish with fresh-frozen breadcrumbs rather than fine, dry ones. The fillets were too long for the baking dish I used, and a bit unevenly shaped, so I trimmed them to fit, and saved the excess fish (around 3/4 lb) for another meal. 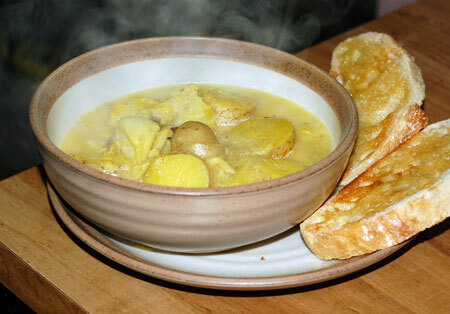 That would be cod chowder with saffron and more fingerling potatoes. Despite the fact that I had to use Better Than Bouillion Clam Base in place of bottled clam juice, this soup came out nicely, very warming. I adapted it a bit from an Epicurious recipe, of which numerous reviewers claimed blandness; I consequently did a lot of tasting and adjusting, and ended up with a subtle, almost buttery broth that served the cod and potatoes well. Since my husband always wants some sort of bread to dip in his soup, I made some very quick garlic toast, and that provided an extra hit of flavor. Stir in milk, creme fraiche, and paprika. Stir in cod chunks; cover and cook until cod is opaque in center, about 10 minutes. Return reserved bacon to the pot; season chowder to taste with salt and pepper. Serve with rolls or garlic toast for dipping. Update 2/1/09: This is one of the few soups that Jeremy actually requests. This time I didn’t have any creme fraiche, so I used whipping cream and added a few dollops of sour cream. We were missing the garlic toast, but it was still lovely, and reheats like a charm. Nolan liked it too: he ate chunks of cod, potato, and celery, and even had a few sips of the broth off my spoon.